The crazier David Pakman thinks someone is, the more he wants you to hear them. The folks at Westboro Baptist Church in Kansas, the virulently anti-gay outfit that pickets military funerals, seem to have figured that out, since they refuse to speak on The David Pakman Show anymore. But there’s no shortage of other, similar voices to take Westboro’s place. Pakman occasionally gets comments on his Web site asking why he gives such people a microphone and an audience at all, if he considers their viewpoint crazy or offensive. But he believes the exposure doesn’t benefit their cause, but actually damages it. Pakman, who has driven the growth of his multimedia talk show to a national presence and a spot in BusinessWest’s 40 Under Forty last year, has no shortage of pluck when it comes to taking on those he disagrees with — which is notable, since he had no aspirations to make a career in politics or radio when he enrolled at UMass about a decade ago. For this issue, Pakman sat down with BusinessWest at his Greenfield studio to discuss how his radio and TV presence has developed over the past several years, and how both his revenue model and his exploration of new media are blazing new, innovative trails in the field of political opinion. Pakman was drawn to radio several years ago, during an internship with the nonprofit Media Education Foundation (MEF) while studying economics and communication at UMass Amherst. “I had no radio experience; it seemed like something that would be fun to do,” he said, so he created a show for Northampton-based WXOJ, known as ‘Valley Free Radio,’ a Pacifica Radio affiliate whose license was held by MEF. 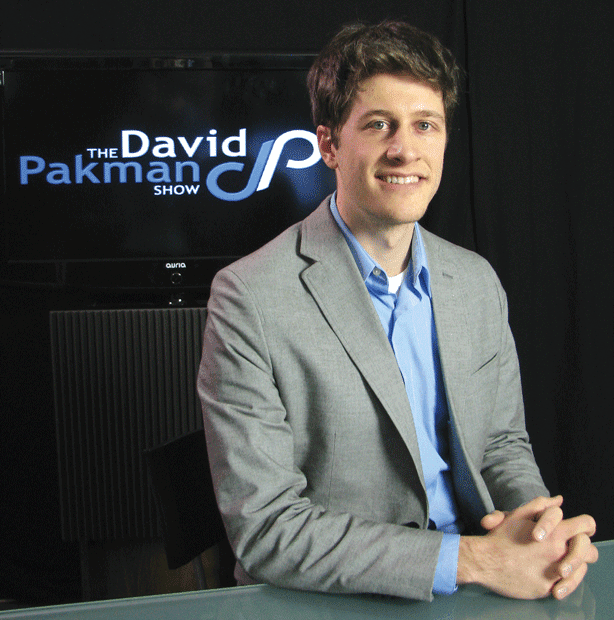 The David Pakman Show focused on political topics from the beginning. As he worked on his MBA at Bentley College, the show was syndicated in 2006 and 2007 to more than 25 Pacifica stations across the country, from Athens, Ga. to Moscow, Idaho, with much more growth to follow. In 2007, Pakman brought in childhood friend Louis Motamedy as radio producer, and the show broadened in scope, starting to attract more well-known guests and expanding to commercial radio outlets. Then, in 2009, Pakman decided put cameras in the studio and expand into television and the Internet, hiring his brother, Natan Pakman, to produce the video side. A year later, that show, Midweek Politics, obtained national distribution through Free Speech TV, airing on satellite television and a number of public-access stations. Best of all, Pakman has forged a mix of revenue streams that allows him to remain feistily independent. He sells advertising, of course, and is a partner in Google’s ad service on YouTube. But he also promotes a membership program by which subscribers pay monthly or yearly for the ability to access extra content. “That started in April 2010,” he said, “and it’s really grown.” He was reluctant to reveal actual subscriber figures, since they tend to fluctuate, but he did note that membership has been rising by about 15% per month. Then Pakman came across a friend’s company, Repair the World, that makes clothing from recycled fabrics, including polyester materials from plastic bottles. He felt that emphasis on sustainability was something his listeners and viewers would appreciate, so he began ordering up logo shirts to sell and wrap into membership packages. That universe typically includes an interview subject in addition to Pakman’s own opinions, and he has talked to some fairly prominent names over the years. That said, the show boasts some prominent regulars, including Ohio’s U.S. Rep. Dennis Kucinich, while Sen. John Kerry, Gov. Deval Patrick, and other luminaries in state and federal politics have made multiple appearances. Sparring with anti-gay leaders has earned him particular notoriety around the Web. 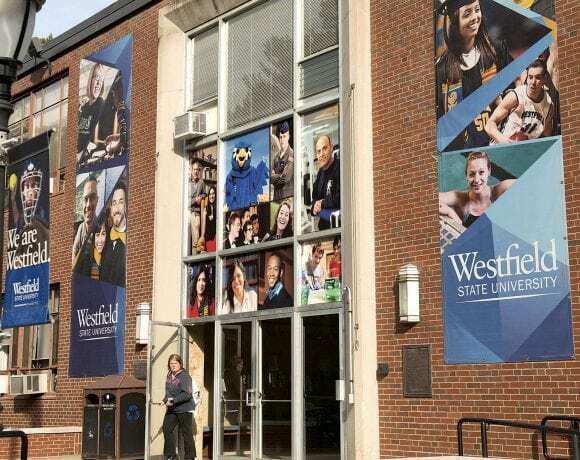 He once mediated an on-air confrontation between Westboro and the Internet hacking group Anonymous, and the latter essentially took over the church’s Web site during the discussion. The exchange wound up garnering more than 1 million YouTube hits. At the same time, Pakman wants other people to learn more by engaging in their own discussions. When asked about the possibility of becoming a major national player in talk radio under a syndication deal, Pakman said he’s not pursuing that model, but rather trying to forge a path in new media. “I don’t really consider this a talk-radio program,” he said. “We’re much bigger on TV, and, combined with the Internet, I consider this a multi-platform show. And already, several automobiles have Internet radio in the car. As the Internet becomes more ubiquitous, being on [broadcast] radio becomes more of a moot point. So The David Pakman Show — which is now the name of his TV show as well as his radio broadcast — forges ahead with something new, something exciting, something … well, progressive. 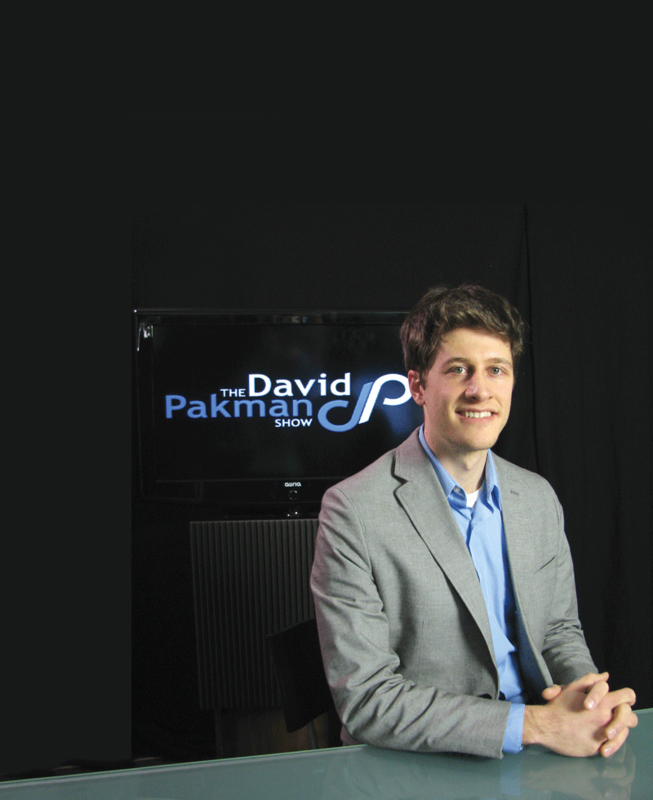 If you don’t know the answer to that question, then you haven’t heard David Pakman. Yet.